SEND EMAIL WITH YOUR LOGO FOR QUICK QUOTE! THESE ARE SOLID - w/floating art or shovel. EXAMPLES SHOWN ABOVE: 5-1/2" Can Cube / 3 sizes of Groundbreaking Rectangles/ 8" high Tapered Rectangle Any shape or size is available - All awards are made to order - Please indicate the shape and size you would like quoted. Theme with metal cast shovel and optional dirt. Description: Clear Lucite taper rectangle ground breaking theme piece. Acetate clear film Embedment with logos and copy. Theme with metal cast shovel and optional dirt. Description: Clear Lucite rectangle with printed card or digital print embedment. Clear film acetate below photo print. Ground breaking Theme with metal cast shovel and optional dirt. Description: Clear Lucite rectangle with 1/8 black (or other) Lucite bottom. 2 color on clear film acetate embedment. Ground breaking Theme with metal cast shovel and optional dirt. Description: Clear Lucite rectangle with 3 color on clear film acetate embedment. Ground breaking Theme with metal cast shovel and optional dirt. Description: Clear Lucite rectangle with custom pink bottom. Ground breaking Theme with metal cast shovel and optional dirt. 2 color Logo and copy on embedded clear film acetate. Description: Clear Lucite rectangle with multicolor digital acetate. Ground breaking Theme with metal cast shovel and optional dirt. Gold Shovel on Clear Lucite Block. Part Number NFSH-221 Die-cast shovel, on top of Lucite clear block. Printing on surface. Production Time 10-15 days after proof approval. Copy Area 7 1/16 in. x 1 3/4 in. Packaging White Folding Gift Box. Pricing shown is blank. For a 1 color imprint add pricing below. Call for rush service. Second Color Printing: $60.00 set-up charge per color or position. Optional Packaging: 2-piece gift box $0.90 each. Proof: $75.00, 4-5 days after proof approval for sample to ship. add 10-15 for order. Size 8 1/16 in. x 3 1/2 in. x 2 in. Copy Area Base: 3 1/2 in. x 1 in. Packaging *Note: Please advise if we should ship in 2 pieces to use as paperweight also, or glued. Set-up Charges: $75.00 per copy. For each additional position, such as imprint on handle, add an additional $60.00 plus .90 each running. 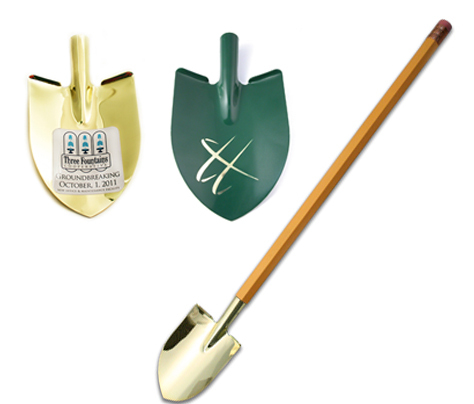 NEW FULL COLOR LOW COST ACRYLIC SHOVEL AWARDS! Email your artwork and quantity (25 min) for pricing. SURFACE PRINTED ONLY AS SHOWN WITH FULL COLOR STOCK ARTWORK. Pricing and all details to be updated soon. "Surface Printed with our stock graphics or your own images" Flat Acrylic - nothing inside. 3 1/8" Acrylic Cube with Cast Resin Simulated Earth and 3-D Pewter-Cast Miniature Shovel. Copy silkscreened on face of cube. SIZE : 3 1/8" x 3 1/8" x 3 1/8". PRODUCTION TIME : 8-12 business days. COPYAREA : 2 1/2" square. MATERIALS : Acrylic cube, cast resin, pewter shovel. SET-UP : $80.00 for one-color, one-location imprint. ADDITIONAL COLOR OR SIDE SET-UP : $60.00 each side, with a $0.60 run charge per side and/or color, per piece. FOR 4 COLOR PROCESS ON A LAMINATED STICKER, PLEASE CONTACT FACTORY. 7" Pewter Cast Shovel affixed to a Black Resin Cast Base. Copy available either on a 6" x 1" Plate or engraved directly on the Base. Gold Shovel optionally available. SIZE : Shovel, 7". Base, 6" x 2 5/8" x 1 7/8" H.
PRODUCTION TIME : 6 - 9 work days. COPYAREA : Approx. 4 1/2" x 3/4". COPY ON BRASS PLATE : $20.00 ea. MATERIALS : Cast Resin Base, Cast Pewter Shovel. COPY DIRECTLY ON BASE : $12.00 ea. Each piece is individually handcrafted. No two pieces will be exactly alike. SIZE : 5 1/2"x 4"x 1 3/8"
PRODUCTION TIME : Approximately 3-4 weeks. Description: Clear Lucite Hard Hat with custom pink bottom. 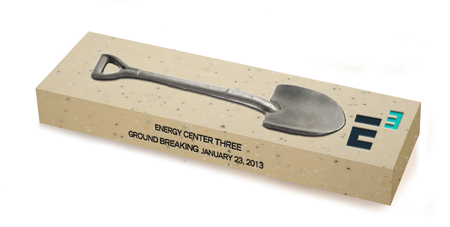 Ground breaking Theme with metal cast shovel embedded in center and optional dirt. Acetate film logos on front and back of hat.